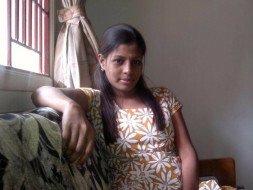 I am Nithyashree a 25 year old resident of India. What started as an episode of typhoid, 2 months later was diagnosed as a complex kidney disease in it’s fifth stage. Since then it has been a struggle to keep up with the piling medical bills. The illness took a massive toll on me, both physically and mentally. So I had to quit my job earlier in February of this year. We were not anticipating the cost of the treatment to be this high. We have already spent all our savings on the treatment so far and were helped along the way by some close friends as we had to do multiple rounds of plasmapheresis and also an operation to remove both my kidneys as my anti GBM antibodies count was not coming down. Now as I await for a transplant, Doctors at Madras Medical Mission have stated the first step is to again do plasmapheresis in order to bring my anti GBM antibodies under control and I need to undergo blood purification through dialysis 3 times a week for another 6 months. I need to undergo 20 sessions of plasmapheresis every alternate day without skipping any sessions. In order to avoid missing any sessions, it is only possible once all the funds are arranged. In the meanwhile I am having to continue to do additional dialysis. Each Dialysis session costs Rs 1,850 and each plasmapheresis session costs Rs 34,000. The transplant costs another Rs 7 Lakhs. The expenses going forward will be between 15-16 Lakhs. Additionally there will be expenses after the operation as well. 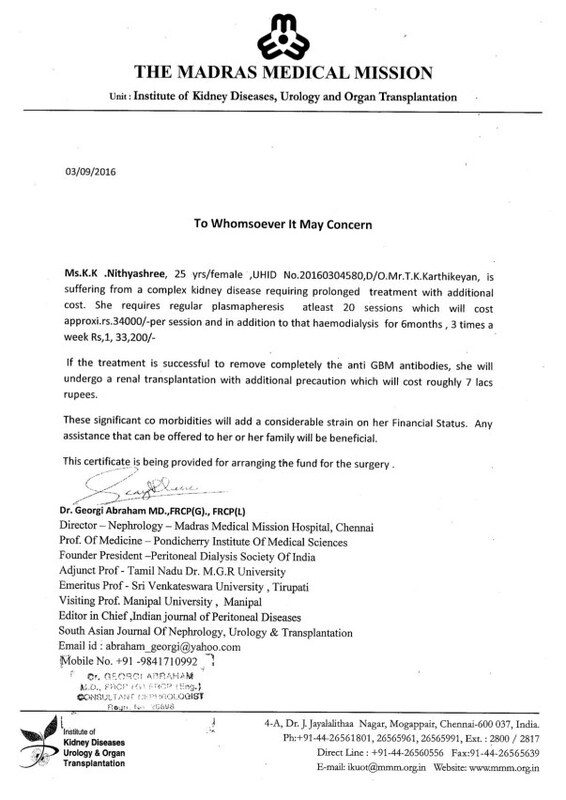 Below is the doctor's letter detailing the costs required until my operation from now on. My dad is an electrical contractor but has barely been able to get any contracts off late and with the real estate market at it’s low point, the signs for recovery seems bleak. I had to put my treatment on hold due to lack of funds and the entire family is stressed and drained both financially and mentally. With this campaign, I want to reach out to each one of you to help me and my family in these tough times. My parents are trying their level best but I can see the stress on them as receiving financial assistance is very tough. I have attached the hospital's estimate letter. Request you to please contribute and help me undergo this treatment. Happy New year everybody. Thanks to all your support I am entering another year fighting this battle knowing very well that there are so many well wishers. The routine life continues with dialysis three times a week and me continuing to work. It's been very challenging to keep up with the expenses. As mentioned before, I am still awaiting the transplant but at the same time worried about how to handle the costs associated with it. I have not got any relief from the PM relief fund yet. I request you all to continue to spread the word and once again if you have any leads at organizations where they might consider helping in such case, please do let know. Life continues to go on and dialysis has become part and parcel of my life. I am still awaiting the transplant but at the same time worried about how to handle the costs associated with it. I am trying to get some assistance through the PM relief fund. I am hoping for a change in fortune. Do request you all to continue to spread the word and once again if you have any leads at organizations where they might consider helping in such case, please do let know. I am hoping for a change in fortune. Do request you all to continue to spread the word and once again if you have any leads at organizations such as Rotary club, lions club or other clubs where they might consider helping in such case, please do let know. I wish you get all that you need. Will be praying for you. I’m Janas friend from office. We pray for your early recovery. Confident for an early surgery and recovery to normal life. Will keep supporting.